On the tenth day of Christmas, my true gave to me………ten lords-a-leaping! My version will be ten “lords & ladies-a-lifting” for the work our trainers and aides do at Push to Walk every single day! I would like to recognize our Push to Walk staff for the heavy lifting they do, literally and figuratively, for our clients. Some clients are able to move from place to place on their own; others need more assistance. Our trainers and aides, male and female alike, are ready at all times to give this assistance. It requires strength, good body positioning and not being nervous about placing yourself in another’s personal space. It takes practice, but our staff does what’s needed without hesitation, many many times a day. Our clients rely on our trainers and aides to give them a challenging and worthwhile workout every time they come through our doors. I believe our staff does an incredible job, and are successful because our clients demand the highest quality. It is definitely a two-way street! Thank you to the most awesome staff a founder could have! Push to Walk is what it is today because of the trainers and aides (in addition to our administrative staff!) we have, how they interact with the clients, go above and beyond their job duties and really care about our clients and their families. If you have a comment you’d like to make from your own personal experience about any of our staff members, please let me know! March Madness – Push to Walk Style! Happy Monday! Happy that warm weather and sunshine have arrived (finally) in New Jersey! I am not a basketball fan, but do follow sports news enough to know that March Madness is a sub-culture all its own. I even know who the Final Four teams were and who’s playing for the championship tonight. But that, I admit, is about all I do know. And I am curious – did it used to be that March Madness actually ended in March, ’cause last I checked it’s clearly April today….. However, at Push to Walk, we had our own version of March Madness going on all month as well. I had the best intentions to write more this past month, but was distracted by some big projects (all good!) and procrastinated, much to my dismay (and that of my Communications Coordinator as well). But I am back! 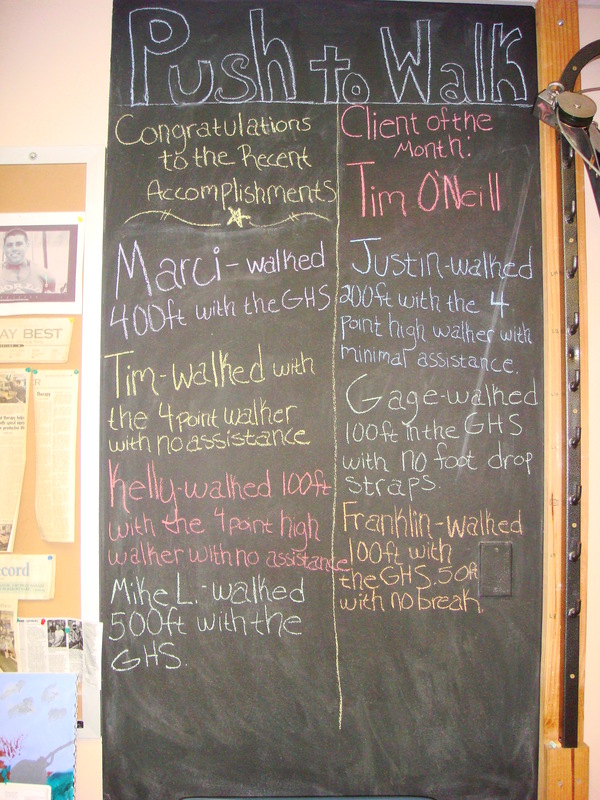 This picture tells of our amazing client accomplishments and competition with each other to be “on the board.” Some of these clients don’t even know each other, others do, and the competition has become FIERCE! I hope this gives you a sense of how hard our clients are working, what their goals are, and what they are accomplishing. Compared to this………basketball is easy!! Let me hear some cheers from the crowd!